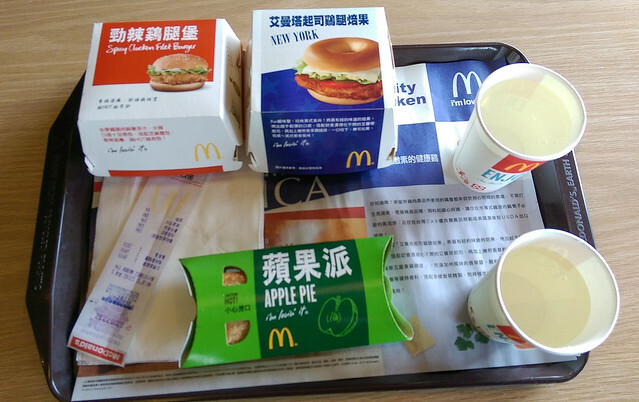 Remember how I visited McDonald’s in China back in September and noted how the menu was different? Well, how about McD in Taiwan?! We visited a location in Taipei across from Tamsui Station for lunch. 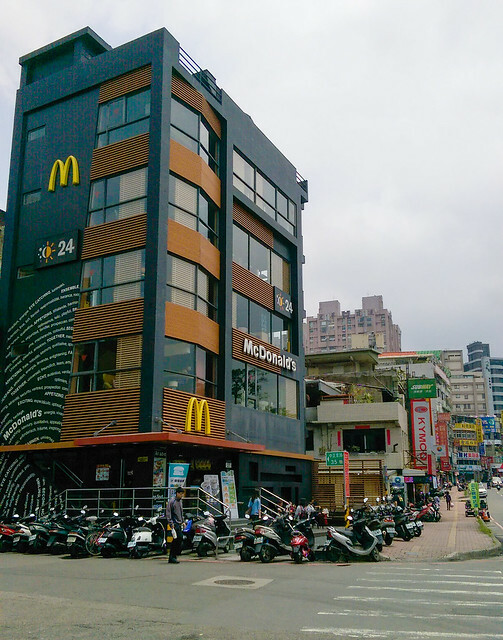 This McD has five floors! If the rooftop counts, that’s six floors! I think if you put each floor and laid it out next to each other, it’d be about the same size as a normal sized McD in the US. The first floor is where the kitchen and cashiers are, and the rest of the floors are dining floors. There’s a tiny PlayPlace on one of the floors, too. 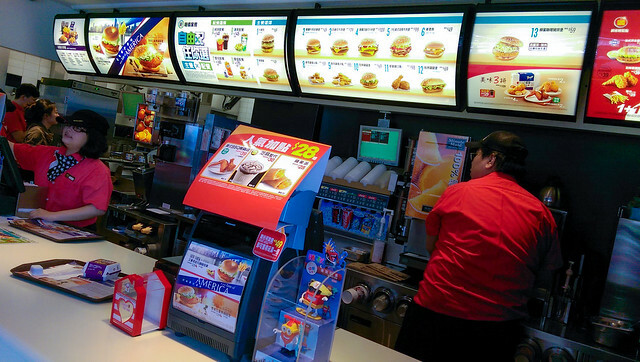 As soon as we got to the cashiers, I looked for an item that wasn’t on the American menu. The big picture on the left side caught my eye (see below). Looks like they’re doing a Taste of America menu which runs until May 26th?! There was the New York with bagel, cheese, mayo, bacon, and chicken & California with five spice herbs and chicken. My sister and I immediately shrugged our shoulders and gave a puzzled face at each other. I’m sure any other American from California or New York would do the same. 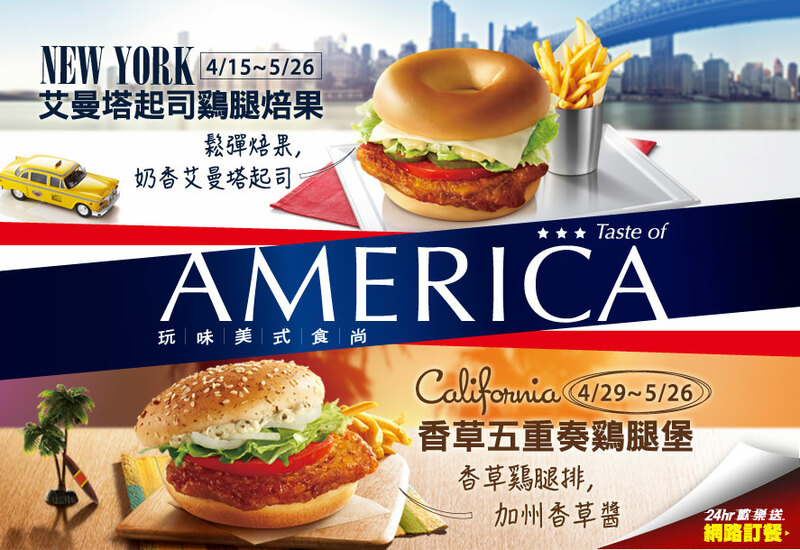 How are the two chicken “burgers” representative of California or New York??! My sister went with the classic spicy chicken, while I ordered the New York and apple pie. My sister raved about the apple pie when she went to Hong Kong several years ago. She even reminded me to get it at any Asian country when I went to HK and China last year. Unfortunately I didn’t, so this was my chance! As always, McD does a fantastic job of presentation. The bagel looked exactly as advertised. Nooope. The bagel was untoasted and chewy. All-in-all it was ingriguing; the chicken breast was moist and tender. I also tried a bite of the spicy chicken, and it was delicious and tasty. 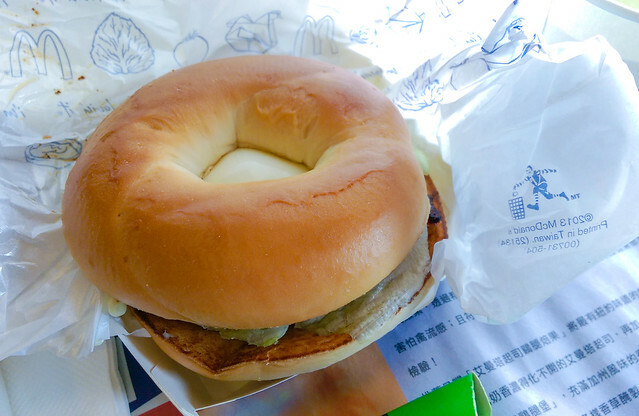 We had to admit that Taiwan does their chicken right. 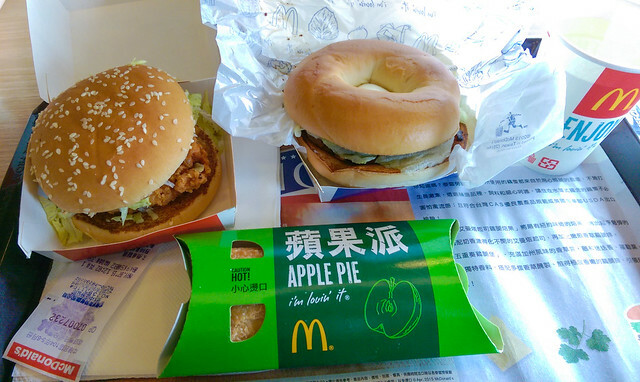 McD’s apple pie in Asia does not even compare to the ones in the US. It is super crispy, flaky, light, and full of the same yummy, sweet, gooey, hot apple stuffing.